The Vector is an innovative speaker concept that meets the demanding needs of audio sound systems. It's pyramid speaker design fits into standard 2'x2' or 2'x4' ceiling tile grids, providing an amazing 360 degrees of hemispheric sound. It has outstanding coverage, greatly improves speech intelligibility and has crystal clear music reproduction. Only minutes to install, just take out one ceiling tile and lay-in the VCA8 within the same tile grid. The 8 ohm input is compatible with any commercial or stereo sound system. The VCA8 Vector Ceiling Speaker Array System's offer outstanding performance, value and are ideal for Classrooms, Office Sound Systems, Conference Rooms, Teleconferencing, Churches, Retail Stores, Restaurants, Schools, Universities and Sound Masking Systems. The Vector employs (3 smaller 6.5") very fast transient response aluminum-woofer drivers that are very powerful and stable. Working in unison these drivers produce clean powerful dynamic sound. When designing the Vector the goal was to have the single most import feature at the forefront, good transient response ("dynamic contrast"). A transient is a sound of short duration, and good transient response can only be achieved if the speaker can deliver its output quickly and cleanly without smearing the original sound, and be completely soundless immediately after. Transients contain the essentials of sound reproduction they provide the sharp pop from a snare drum, the cutting edge of digital sound, the dynamics of the human voice. 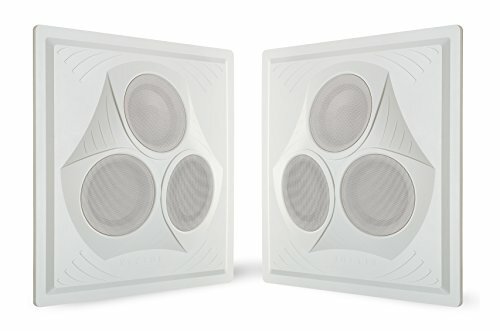 Larger 2-way cabinet loudspeaker systems offer relatively slow transient response, and the small high-frequency horn tends to beam a narrow, blaring sound at the listener-end result, muddy sound. By replacing larger speakers with four 6" drivers we increased the driver surface area while creating more punch and a tight, more focused low-end. If you have any questions about this product by Pure Resonance Audio, contact us by completing and submitting the form below. If you are looking for a specif part number, please include it with your message.